M There are 5 products. And architectural curiosity. 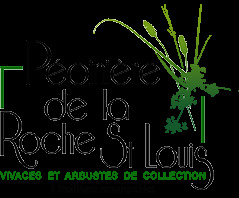 Perennial of the family umbelliferae. 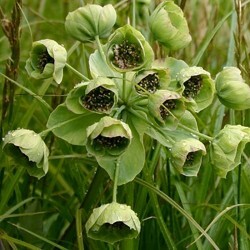 Surprising flowering strangely resembling that of hellebores: umbels of green jade pendant flowers fading old rose. Creepy cut green foliage. Fertile, well drained soil. 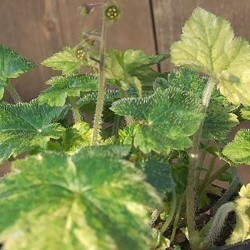 Beautiful shrubby plant with upright habit and rapid growth. 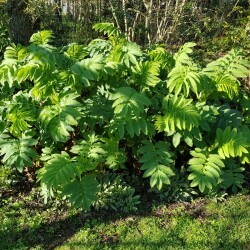 Wide deeply toothed leaves blue-gray. Long vertical clusters of red-brown flowers. Very fertile soil, sandy, dry fresh, well drained in full sun. 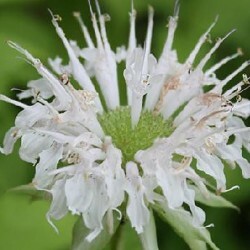 A white bee balm which forms clumps slender beautiful aromatic foliage, deciduous, toothed. Pure white flowers with ruffled petals grouped around a green heart. Any good ground drained and fresh. 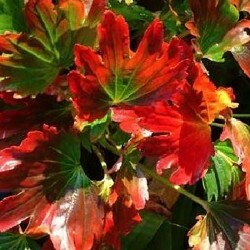 Remarkable for its multicolored red orange and yellow foliage green late summer, this perennial dombre blooms in early spring. Small greenish-white flowers with heart-like brown to bergenia.